We are extremely excited about our Phoenix Alumni Reunion over the Remembrance Day long weekend, November 11-13, 2016! 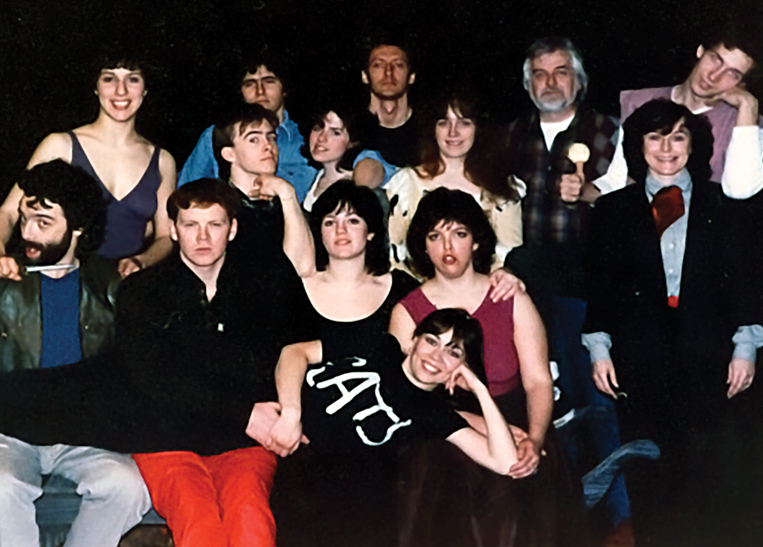 The Department of Theatre will open its doors to five decades of alumni – and their families – for a weekend of reminiscing with old friends and meeting new ones! With amazing support from our sponsors, iA Financial Group and UVic Alumni Association, we’ve kept the prices super accessible so that as many people as possible can attend. There are four reunion events over the weekend, and each one is ONLY $5! We’re also asking all alumni, faculty and staff to pay a small registration fee. Just $5 until September 30. $10 after October 1 and $15 after November 1. Book early and save. Deadline for Registration is Midnight, November 7. Click here for a detailed agenda of all Reunion events. Return to our black box for a friendly gathering of Phoenix alum! Reconnect with old friends, faculty and staff, check out a slideshow featuring old student and production photos, and get to know Phoenixers from other generations during a night of fun in “the Mac!” Appies and cash bar. This event is for alumni only. Join us as we celebrate the Phoenix’s legacy with a decade-by-decade gathering that includes a buffet lunch for alumni and their whole family! There will be a photographer on hand to capture photos of each decade of graduates. Share memories and swap stories over refreshments while Enchanted Fables Princess Children’s Parties, an alumnae-owned and run Victoria company, entertains your kids! Take a morning jaunt at your own pace on UVic’s beautiful chip trail. Travel around your alma mater’s gorgeous campus while socializing with friends and family. Lots of prizes! Meet at the Phoenix. The alumni reunion closes with a farewell brunch for our former students and their families following the Fun Run/Walk. Gather old friends and new, share contact information, and say goodbye over coffee, tea and a light brunch. The Department of Theatre has arranged a preferred rate of just $90 per night (plus taxes) at Hotel Zed (3110 Douglas Street, across from Mayfair Shopping Centre) for any nights during the Alumni Reunion (November 10-13) OR the Alumni Festival (October 11-29). Hotel Zed is a fun and eclectic, retro-styled hotel (think typewriters, rotary phones, vinyl records and a ping pong lounge). They will provide shuttle service to UVic for reunion events in their funky 1967 VW shuttle bus! $90 per night offer applies to single/double occupancy in the Zed 2 Bed or Zed King for A Night and it’s only $85 per night (plus taxes) for their Bachelor Pad. Or check out their Sweet Suite (sleeps 6) for $120 (plus taxes) for single/double occupancy. Additional adults are $10 per person. Use the online booking code FESTIVAL for booking in October, or REUNION in November. Want to talk to a real person? Call them toll free at 1 (800) 997-6797. Alumni who have a UVic Alumni ONECard receive discounted hotel rates at the following hotels: Accent Inns, Arbutus Inn, Chateau Victoria Hotel and Suites, Delta Victoria Ocean Pointe Resort and Spa, and Swans Hotel & Brewpub. Visit the Alumni Card Partners page and scroll down to Travel and Accommodations for more details. Some local Phoenix alumni have mentioned that they would be interested in offering accommodation for visiting alumni during the reunion weekend. If you have space, or need a place to stay, we recommend posting a notice/request on the Phoenix Theatre Alumni Network.